I love this post! I'm slowly trying flexible seating arrangements (the yoga ball bouncing was driving me crazy too. . .) Logistics question: where did your students put all their "stuff" that usually go in desks? Books, notebooks, folders? Thanks! I went to FCS last year and I will not go back. I use crates ziptied together in groups of four (found on Pinterest) for students cubbies to hold all of their personal items. I had them all in one place last year, however this year I decided to spread them out around the room to cut down on the crowded chaos when retrieving materials. I am excited to try it with a new group of students. 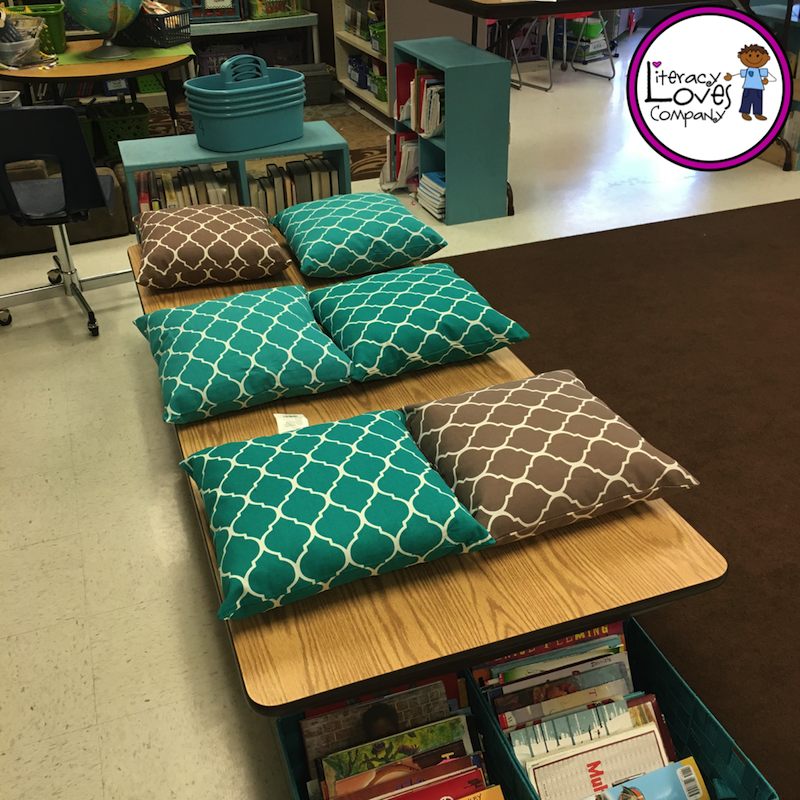 Each student has a "home base" , as they like to call it, for their pencil boxes, notebooks, etc. I know some other teachers have gone completely to community supplies, but I like my students to have responsibility for their own belongings. This is so helpful! I'm seriously considering FCS for next year! You have encouraged me to experiment this spring and get rid of some issues before fall! Would you ever share your signs for each table area?! Hi Tammy! Do it! It has been wonderful! We have been fully FCS for the last couple of weeks and things have calmed down. My students are less interested in the yoga balls and more interested in sitting where they are comfortable and can get their work down. I was a bit worried that first week, but the novelty has worn off a bit. 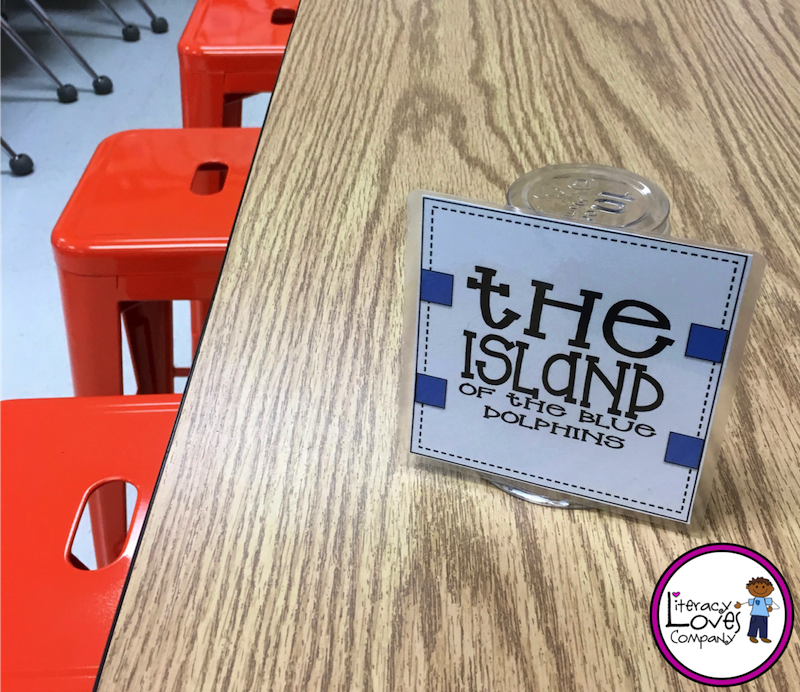 Thank you for the question about sharing the table signs! 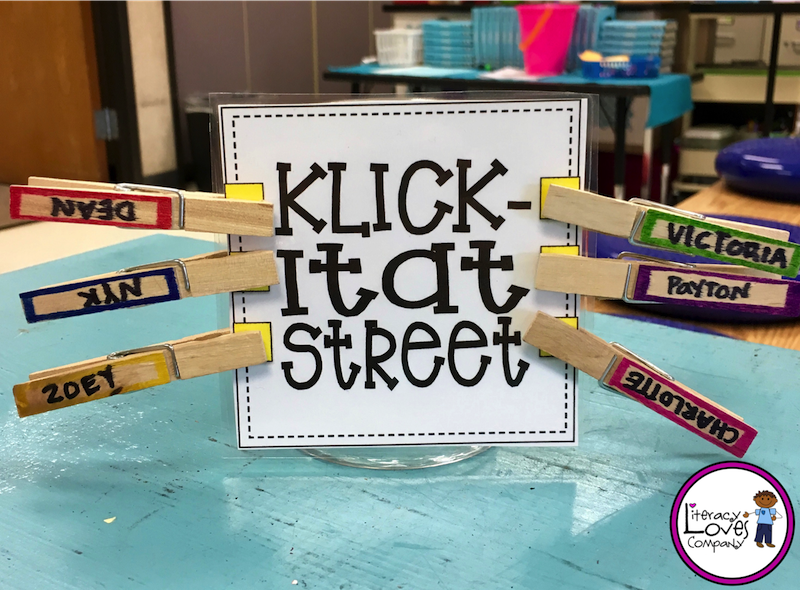 I've added them to the post, so you can now download them and edit them to meet the needs of your classroom. Thank you for visiting Literacy Loves Company and I wish you all the best on your CFS journey! Hi Dooley Teacher! I bought all of the seating from Amazon.com with the exception of the crate seats. The rings for the yoga balls are actually from S&S Worldwide, but I got them from Amazon. They are actually considered recess equipment but are perfect for the yoga balls. I bought the 14 inch rings. My teammate bought the 10 in. and they were too small. All in all, it cost about $700. I didn't have to buy tables and I already had cubbies and rugs so that helped. I am doing FCS this year and have loved reading your post. You mentioned you got the yoga ball rings from Amazon. What are they called? Can't seem to find 14 inch ones. Hello! I don't think they have them in stock anymore. My colleague tried to buy them soon after I did and wasn't able to find them either. :( I've also seen the foam rings you use for floral arrangements. Those might be an option. Frisbees are what we use in my room to keep the balls from rolling off the desks. Frisbees are a great idea! Thanks for sharing! People have also shared that they use a pool noodle taped together in a circle to make a ring. Love this idea! I just wish I had tables instead of desks :( I have 26 second graders in a classroom built in the 60s, meant for 18 kids.... it's too cramped! I really wish I could do this, but there is not even 1 table in the whole school available! Hi Jenny! Thanks for the comment. Have you thought of putting up a project on DonorsChoose.org. It really isn't that difficult of a process. One of the teachers in my school got new tables funded that way. I think I heard somewhere that there is a GoFundMe for Teachers available also. Going to tables without chairs made my room feel a lot more spacious! If you don't have access to tables, you could zip tie your desks together and lower or raise them to create a table. I think you could use clipboards at some seats. Silly question, when you are giving instruction do the kiddos stay at the tables or on the carpet??? Also, are you going to start this begining of the year? If so how do you think it will go starting thrm with this rather then ssigned seating? Hi Jill. It just depends on what is going on in the class. Sometimes I pull them all up to the carpet if I have something on the whiteboard I need them to pay particular attention to. Other times they stay at their tables. I am planning on starting this at the beginning of the year next year. All of my students will be assigned a cubby for their belongings, but I won't assign seats. Eek! I have no idea how it will go. My class this year is very well behaved and so I haven't had any real problems. I think one of the things that helped is that they were involved in the process. With a new class coming in, I'll have to work hard on expectations and routines for the seating right off the bat. I am going to be switching from Kinder to 3rd grade next year and I'm interested in trying this out. How do you handle state testing though? Hi KTeacher10. We do our state testing on the computer and we have a computer lab so right now it isn't a problem. 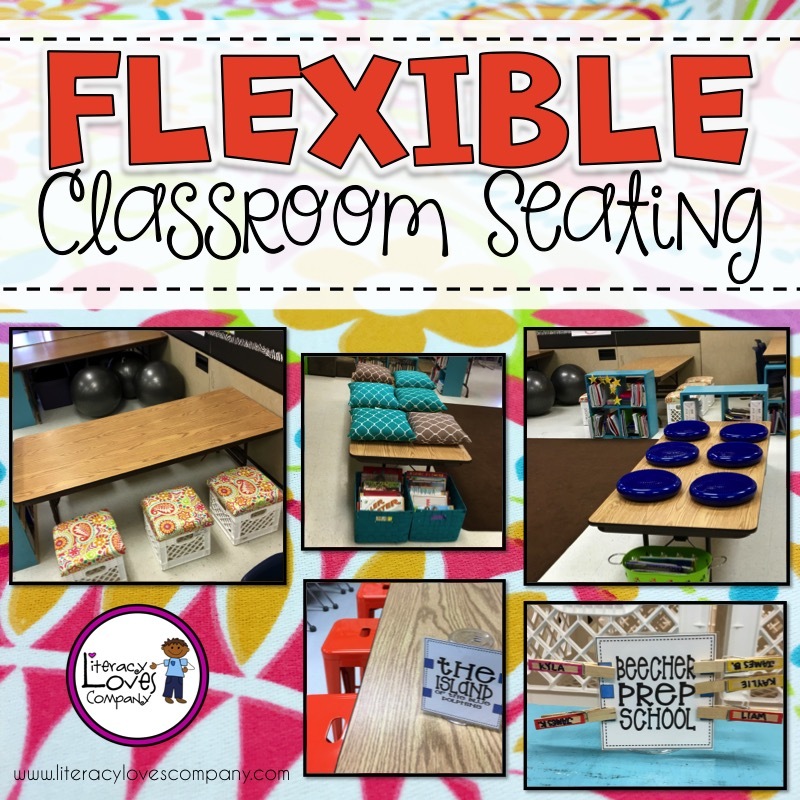 I know several of my colleagues are switching to flexible seating and we are getting Chrome books to do state testing on next year, so that is something we will have to discuss and make a plan for next year. I don't think it will be a problem. I have plenty of seating for my students to spread out and space for privacy folders. I have students use two of their folders to create little areas ( I call them test barricades, others calm them office spaces). Would those work for state testing? I also provide clipboards and let my students move anywhere they don't have a neighbor. About the backpacks...my first year of teaching my students would not stay out of their backpacks. Hanging on the back of their chairs created too much of a temptation. So my solution was to find an open wall are of my room and attach Command hooks to the wall. I numbered the hooks and assigned students in alphabetical order. The 3 pound hooks work beautifully. Love your ideas. We have removed all desks and tables are working out very well. 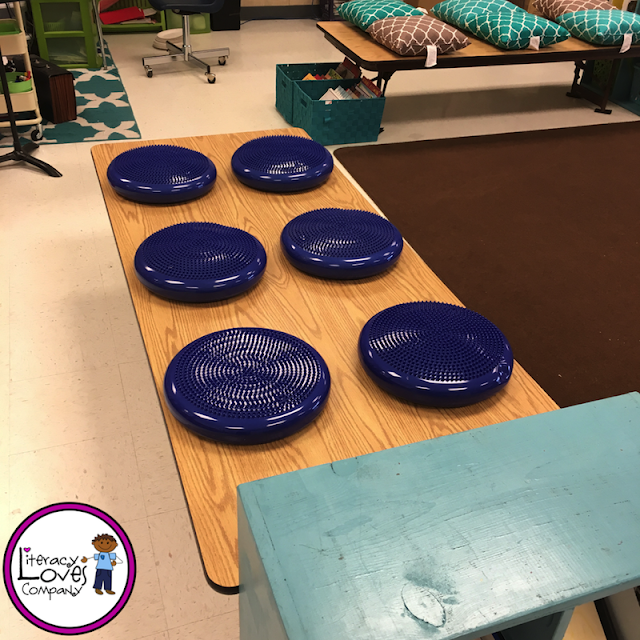 Flexible seating seems like a great "next step"!! Command hooks are a great idea! Thank you for sharing! Love this post! 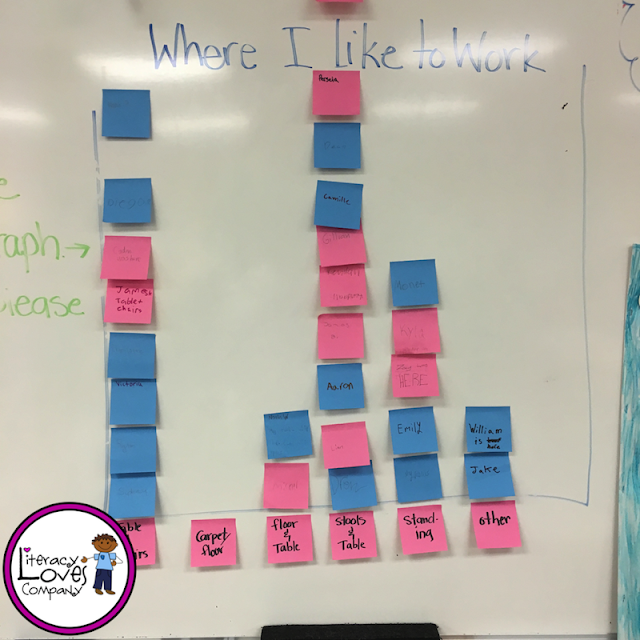 Your photos are fantastic and really helpful in trying to visualize how this works in a real classroom. It was such a good idea to involve your students and do the action research first. Fabulous! I teach elementary gifted with a different grade level and number of students each day. I've ventured further into flexible seating over the last 5 years. I too had trouble initially with the yoga balls, but it settles down quickly. I agree with your suggestion to try Donor's Choose for getting tables. I was able to get two beautiful blue tables for my classroom a few years ago. They looked amazing and worked perfectly! 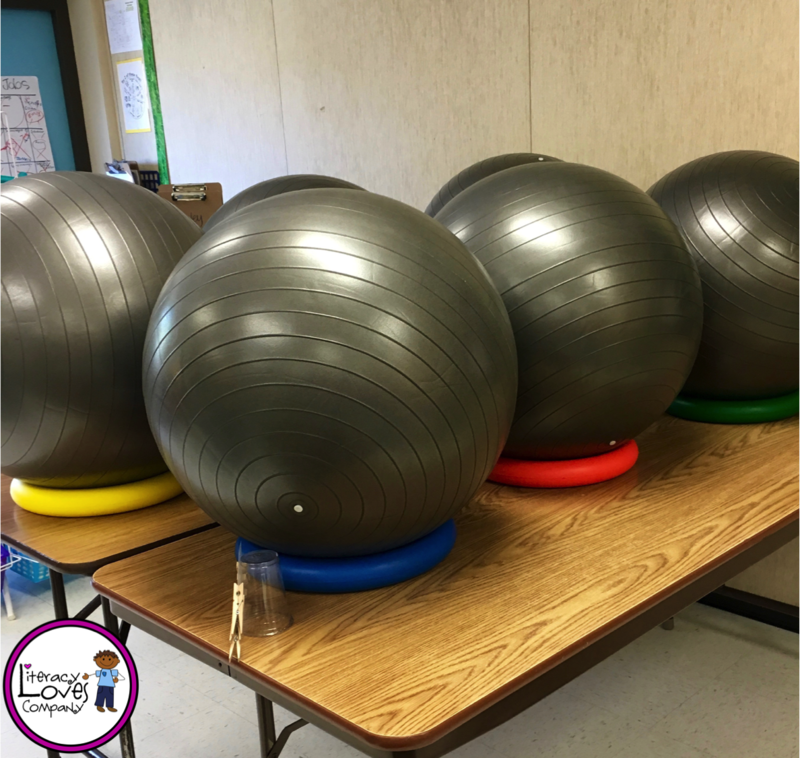 I also used Donor's Choose to get six yoga balls for my class. The parents of my very active and fidgety students were HAPPY to donate to the project to help their children stay on task better in school. Currently, I'm using bucket seats for my computer tables and my collaboration corner. These are easy to make out of white 5 gallon buckets from Lowes, a little extra thick foam to pad the seats, and inexpensive cotton fabric. A side benefit for the bucket seats is that you can store things in them. I use them to store boxes of tissue, paper towels, and baggies. All light weight, but bulky to store on shelves. Another plus to the bucket seats is that you can take them outside , if needed. Do you happen to have a picture of your entire classroom? (So I can get an idea of how everything is set up?? No, I'm sorry. I don't have a photo that shows the whole classroom. We moved our rug to the middle of the room and all of the tables are situated around the rug. We have moved and adjusted tables a few times since I wrote this post so the layout is constantly changing. I have been looking into flexible seating for my classroom next year. I love your post! I think you did a great job introducing it to the students and having them be active participants in making sure it worked! Wow! Thank you, Emily! Even after a few weeks, I still try to check in with them and see how they are feeling about the change. So far so good. I think that flexible seating would be great for 7th and 8th graders! I'm not a middle school teacher, but I would think they would enjoy the freedom to make choices just as much as the younger students. Especially if you could manage a set-up like a coffee shop type atmosphere. They might think that is cool. :) Best of luck! So many great ideas on how to roll out and manage! Thank you for sharing your experience!! Thank you for stopping by, Kelli! 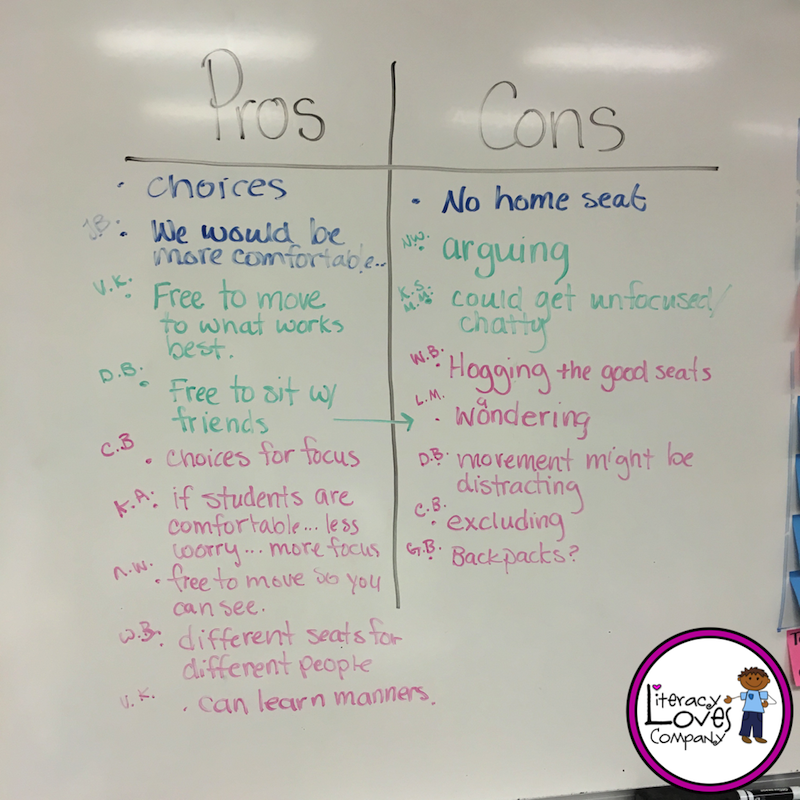 When a child makes a poor decision and losing their free choice seating, where do they sit? Do you just assign them something? Do they get the last available seat? Do you have a particular spot that they would sit? I love the ideas for launching this! I tried it during our last two weeks of school this year, and we just kind of dove-in headfirst! My students did well with it, thankfully. I will definitely be using some of these ideas at the start of next year. You can totally still do this with desks! I just removed legs from some, and raised some all the way up (and left some for use with chairs, of course). My students already had book boxes (magazine files) for their independent reading books, so we just started using those for the textbooks and workbooks that were in their desks. Hi Jessica! Thank you for commenting! 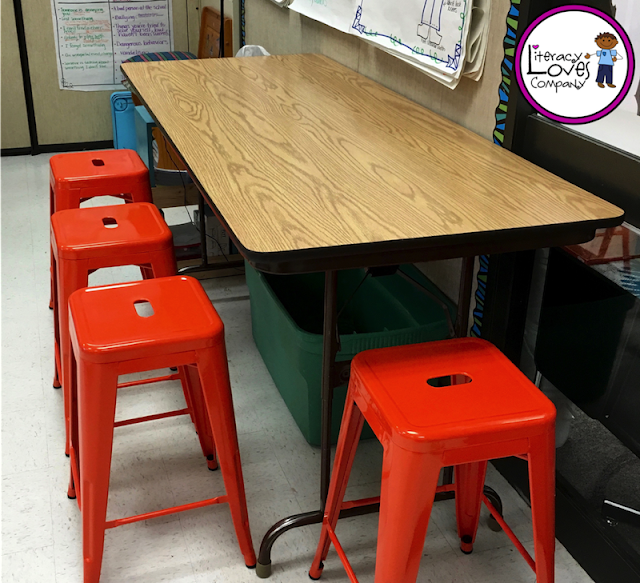 I like that you can change up the environment of your classroom no matter if you have desks or chairs. 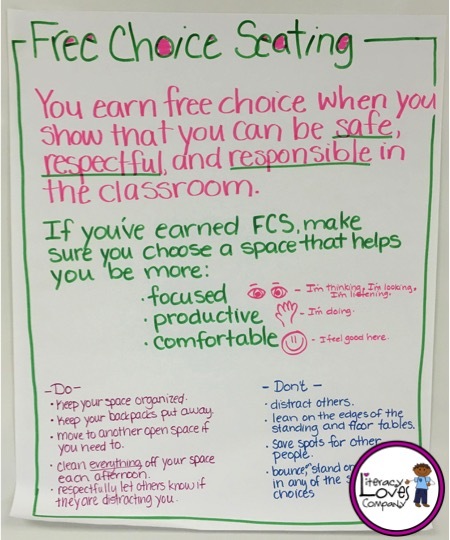 Several of my colleagues at school have begun to incorporate flexible seating in their classrooms and it is fun to see all of the creative ideas people are coming up with. :) I guess that is another reason we can call it "Flexible Seating". How tall are your "short" tables? I took the legs ox completely then put rubber caps on the part of the legs that are welded to the table just to protect the carpet. Perfect for my 3rd graders. What do you mean by taking off the legs completely? Did you break them? A lot of tables have adjustable legs that go up and down. You can pull them completely out and you are then left with the part that housed the leg. I pulled the legs out completely and just left the housing. This made it so that the table still has legs, but they are very short. If you look at the photographs in my picture, especially of the one of the kids sitting on the floor, you can see what I mean. When you pull the legs out and the casings are left, you have to be careful that they don't scratch up your floor. I used foam squares to put underneath. I've heard of others using carpet, tennis balls, rubber ends, etc. I hope this explains it. :) Thank you for visiting Literacy Loves Company Blog! Do you have a "map" of your classroom arrangement. I really want to try some flexible seating next year and am trying to imagine it in may room. 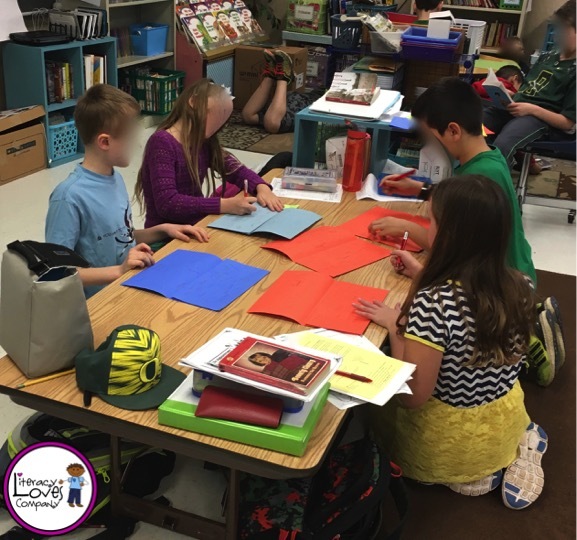 Do your kids always come to the rug for large group instruction, or can they see the board from any seating option? I opted for t-stools rather than yoga balls. They are still wiggly, but the take less room and won't pop. Thank you for this post! I have been considering my options for flexible seating also. 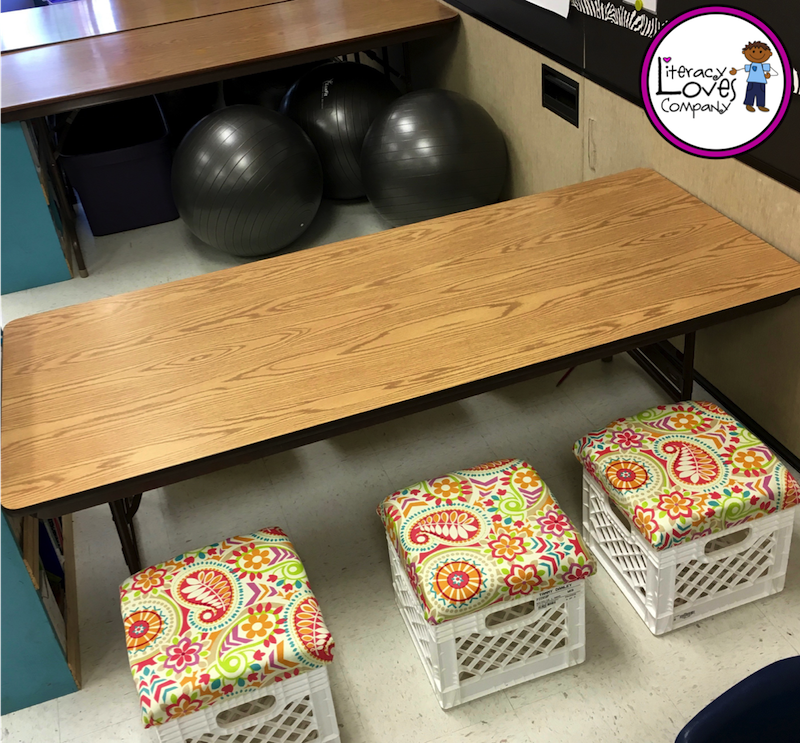 After continuing flexible seating for the rest of the year, is there anything you plan to change or tweak before next year? I know I do something one time and think how I can make it better next time. I was just wondering if you had any of those thoughts. When I first implemented this in my classroom, I changed something almost everyday. I think I finally have the layout figured out. I think the only thing I am going to change is to make my classroom library a bit smaller to give more space for peripheral seating. If you check out my "Classroom Reveal" post, you'll see that my library is quite large. I'm hoping to get new bookcases that all match and I've already started weeding through my books. I love how you included the students with implementing. The only thing that I can't seem to find online is the rings you used for the yoga balls. I have looked on Amazon and S&S Worldwide. Perhaps I am not using the correct search words. Any suggestions? I got them on Amazon, but when my teaching partner went to order her a set she couldn't find them either. She found smaller ones, but they just didn't work for her. I must have gotten lucky and they had them when I was looking. She tried pool noodles, but I don't think that worked out for her. Maybe those foam rings you find in craft shops for wreaths? Yikes! :) I bet with a lot of structure and clear expectations they will do great! I teach K5 and would love to implement this in the fall, what would you suggest as a way to start is? I have some scoop seats already, but I plan on getting more as time gets closer. Thanks for your help. I'm in the same boat. We started mid-year, so this will be my first time starting this with students I haven't built a rapport with yet. Here is my plan so far: I think that I'm going to assign seats for the first few weeks so that students get an idea of which seating choices are comfortable and which don't work for them. I will also have a chance to get to know my new students a little better. I plan on setting the guidelines and routines right from the first day and make sure I am pretty strict about them. I try to do a lot of communicating and problem solving with my students and buy-in is very important in order for this to be successful. When I started this last year, I checked in with my students a few times a week to see how it was going, what the problems were, and what solutions they had. I hope to do the same thing this year. I hope this helps. I don't have my plan all set out yet, just these basic thoughts and ideas. best of luck to you! Thanks for sharing so many great ideas. 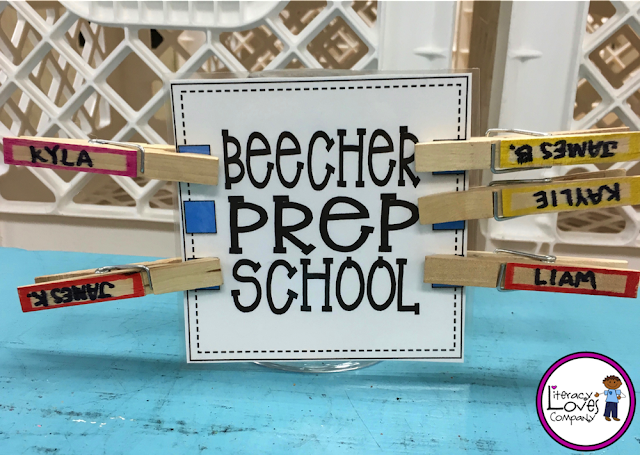 I used your table signs and tweaked them for primary. I'd be happy to share the primary ones if anyone wants them. I would love to see your primary ones Katie! 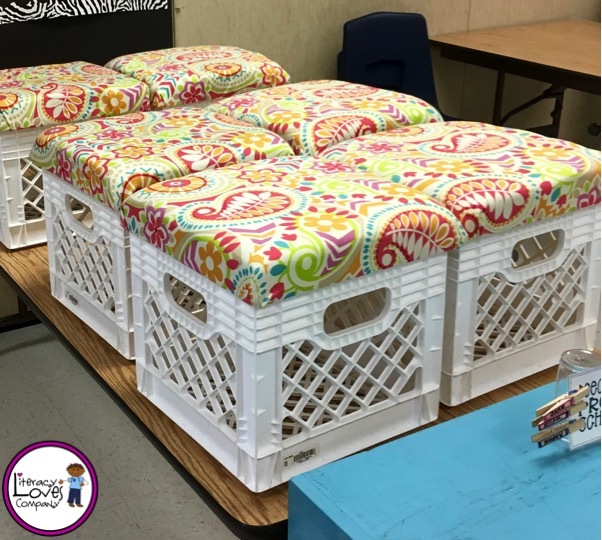 How did you make the crate seats? I wrote a blog post on how I made the crate seats. You can find it HERE . Thanks for visiting! I have 3rd graders. I purchased yoga balls that are 55inch diameter. I'm worried they will be too big. Do you know what size you purchased? Hi Laura! I got 65 in. but didn't inflate them all the way. They are perfect for most of my 4th graders. I hope this helps! I think this type of seating works well for all age levels. You just have to make sure there are clear expectations and students understand the consequences for not making good choices. If you google this topic you will find a lot of different age level teachers who are moving to flexible seating. 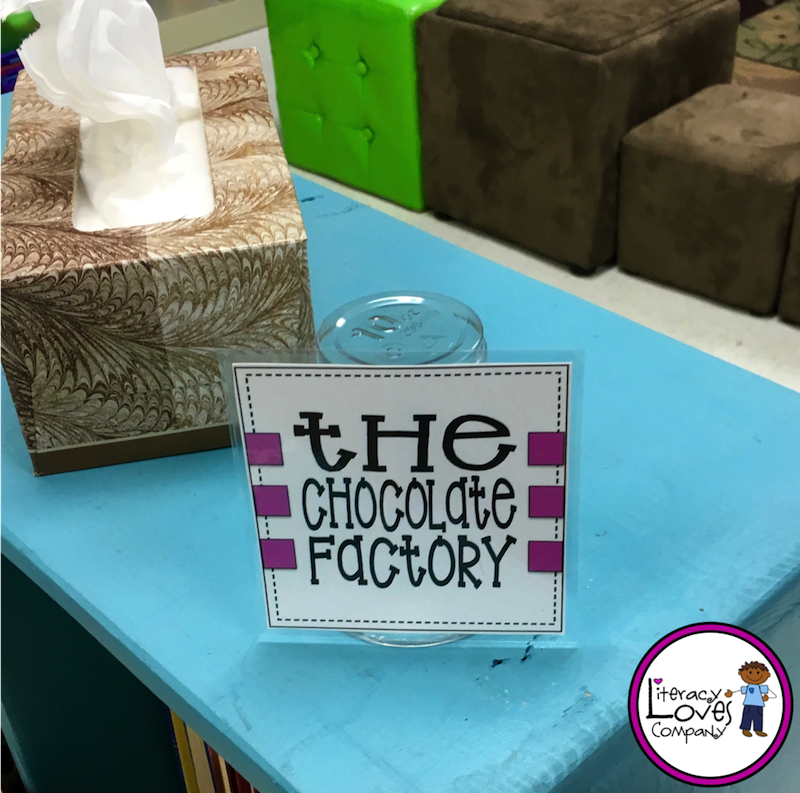 Thank you for visiting Literacy Loves Company! I wish you the best of luck on the upcoming school year! I LOVE FCS! I have done it in little bits over the years, but I want to make some more changes this year. I would love to have a standing table/ bar stool table like yours called "The Island". How tall does that table rise to? Also, where did you get your floor cushions and what size are they? Can you tell me what the last don't on your anchor chart says? Part of it is blocked and I would love to do something similar this year. It says "bounce on, stand on, or lean back in any of the seating choices. Best of luck to you on this flexible seating adventure! Where did you get the tall red stools? Price? I got the stools off of Amazon.com. I just looked and the orange ones are about $140 for the set of 4. I've also seen them at local stores such as Fred Meyers for around $25 each. I love this! 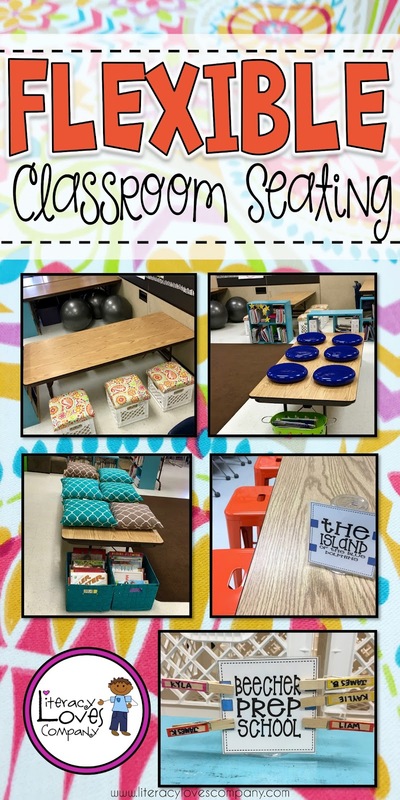 Definitely using many of your ideas in my room this year! I was curious a little about the rings you put under the yoga balls on. Is that just for clean up that you use the rings or do the kids sit on them under the yoga ball? If the kids don't, how do you store the rings during the day? I was able to order the 14 inch rings on Amazon. Hi Hilary. Most of the time we use them to keep the balls from rolling around when we weren't on them. When they weren't in use we stacked them on the back of the table. It was a big table. :) I'm glad you found the rings. I haven't seen them available in a long time. What search term did you use to find the rings? I can't seem to find them on Amazon. Spectrum foam ring set. There is a 10" option that appeared. I clicked it and was able to switch the size to 14"
Hello! I'm planning on doing this for next school year; and I already have most of the necessary things to make it happen. I will love to buy some of those "wiggle seats". I like the ones you've got; where did you buy them? One thing to take in consideration is that I teach at the High School, so probably the discs need to be bigger than those. Even at the High School level we have antsy students! Most of the seating choices I purchased on Amazon.com, including the wiggle seats. I am hoping to try this next year with my 4th graders, I am super excited! When you gather on the carpet and go over the day and let the kids choose their new spot for the next day, how long does this take? Do they have to stay at that spot the whole day the next day? Love your blog! It only takes about 5 minutes or so. They quickly pin their clips to the cup and then line up. That is their home spot the next day. 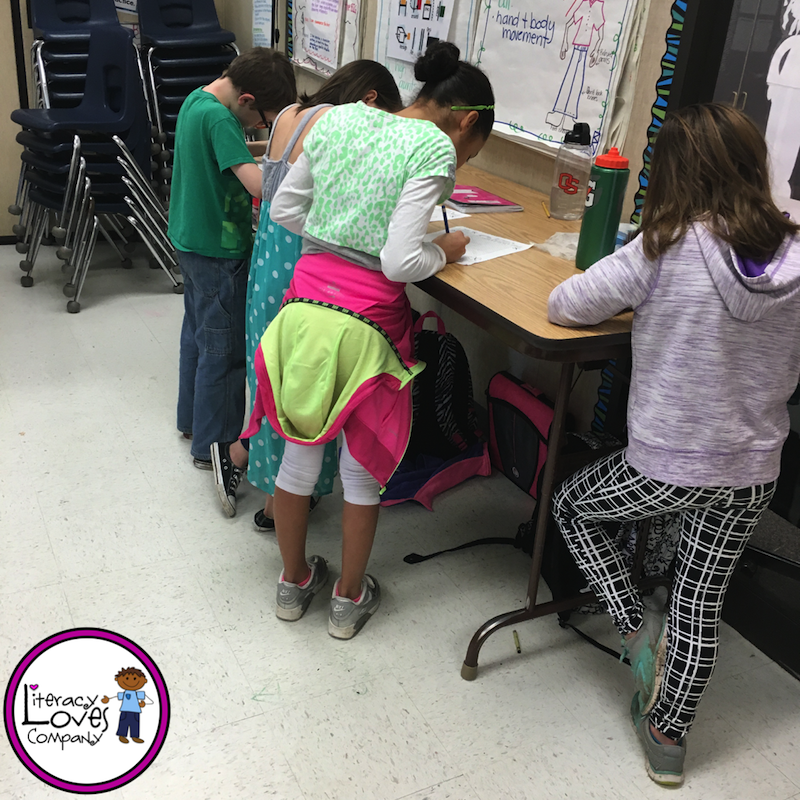 Throughout the day, students may move to the carpet, stand up, or move to an empty spot if they find they cannot concentrate at the space they picked. 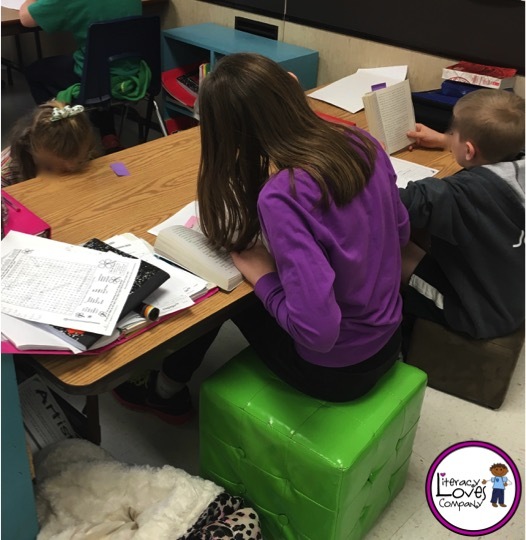 I am very intrigued by flexible seating and really wanting to try it next school year but my biggest concern is how you do your weekly testing, like spelling, reading, etc.? Students all have a table space to take tests at. I am also okay with my students sitting on the floor or in beanbags with a clipboard if that is what is comfortable for them. I also got lap desks from Ikea. Students like to sit at them on the carpet for tests. Hello! 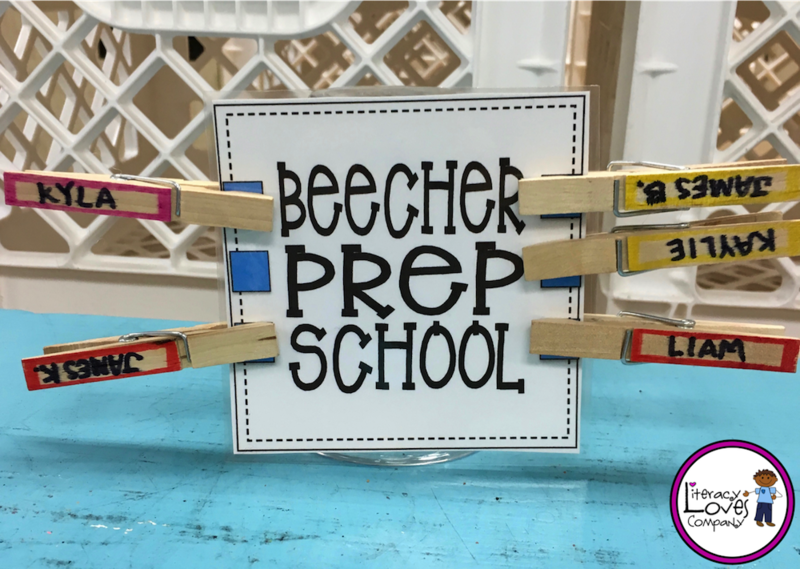 How do you get the table signs to stand up and be durable to hold clothespins? the signs are laminated with thicker laminate. I used double sided tape to attach them to the cups. I never had a problem with them falling off or over. Best of luck! Where did you purchase the teal book bins that are under the table?